In 1990, the Intergovernmental Panel on Climate Change (IPCC) predicted temperature rises that would occur over the next 40 years if climate change was left unchecked. According to a new report published in the journal Nature, the Earth has been warming at a rate consistent with these predictions made 22 years ago. Reports have shown that emissions are increasing by about 3% a year, with an increase of about 58% over the last 22 years. According to Professor England, forecasts are available on the low end and high end of emissions, and at the moment, the high end rates are being used. He also mentioned that if no action on lowering emissions occurs, it will be the high-end scenarios that cause the most damage. Those scenarios are scary, to say the least. It’s reports like this that give even more weight to the existence of human-caused climate change. Despite some remaining skepticism, nearly all from outside the scientific community, it is undeniable that serious action needs to take place as soon as possible. 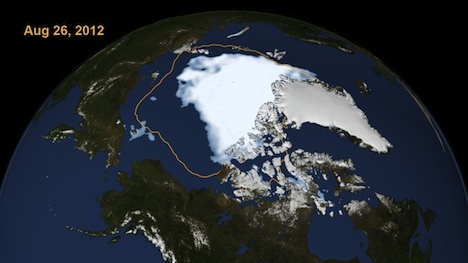 Image: Scientific Visualization Studio, NASA Goddard Space Flight Center: Arctic sea ice at a record low extent in 2012.